Four men were held and a half-dozen stolen motorbikes recovered in a string of arrests by Pattaya police. 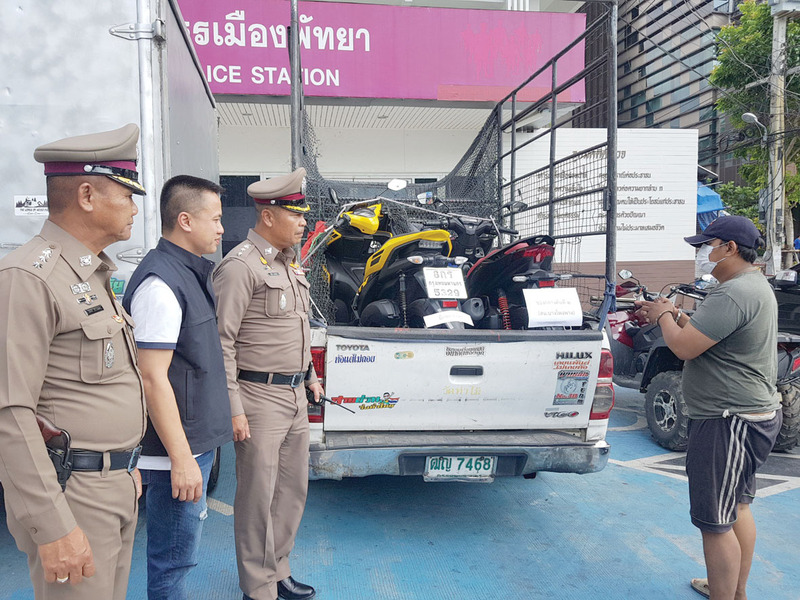 The arrests of Boonyarit Chiksiri, 34, Nipon Dechnim, 35, Boonlai Pathamwong, 28, and Suwit Wongsupeng, 29 were announced Feb. 28 along with the recovery of six motorcycles and three pickup trucks. Police following up the report of a motorbike theft tracked the vehicle to a lot behind the Index Living Mall on Sukhumvit Road with Boonyarit found nearby. Police said he confessed to stealing the bike and was waiting for the buyer. So police stuck around and captured Suwit when he arrived with a covered pickup to take it. Suwit ratted out his employer, Nipon, who had ordered him to deliver it to a house in Nakhon Pathom. Nipon was then caught with additional stolen bikes. As they were cuffing him, Boonlai contacted Nipon to deliver yet another stolen motorcycle, so police scooped him up as well.